Picturesque Scenery: Wish to observe and admire the snowy, raw beauty of nature? Then Greenland is the perfect place to be. The world largest island welcomes international travellers with its picturesque villages, spectacular scenery, unenclosed wilderness, exciting activities and lots more. It is located between the Atlantic and Arctic Ocean, geographically. Greenland is part of North America, politically and historically it is associated with Europe and it is also a part of Denmark. Below is the taste of the most popular experiences in Greenland. Blue River is the largest floating glacier in the Northern hemisphere known as Petermann Glacier. It is one of the most significant and gorgeous natural wonders of Greenland. Blue River resembles a vein dissecting a frozen desert of ice. The melting Petermann Glacier fills the lower areas of the glacier and creates clear blue water, causing the river to change its shape. The vibrant blue colour comes from glacial silt. Nevertheless it is always stunning. Tourist can go snowmobiling or skiing in Greenland but nothing compares to the old tradition of travelling dog sledding. To many people, Greenland is almost synonymous with dog sledding. The best way to experience Greenland is riding a dogsled through the white landscape. While the only sounds breaking the silence comes from the panting dogs and the crackling snow. Dog sledding is for everyone and it’s a two hrs ride or expedition lasting several days. On this spectacular trip you will explore the fascinating Greenlandic ice cap and spend the night in a tent in the middle of the ice. You can drive from kangerlussuaq through tundra and moraine valleys to the great Greenlandic ice cap. With a little luck we might see some musk ok, Arctic foxes or reindeers on the way. Explore the unique landscape of the ice cap, fascinating valleys, melt water lakes and glacial rivers. In the evening you can enjoy a breathtaking view of the glacial landscape in the midnight sun. Exploring Greenland on a cruise liner is fun and authentic experience. Various cruises will provide different itineries depending on your preferences. Marine animals like whales and seals can also been seen. Best time to go on a cruise is between June and October. On many visitors Greenland wish list is to experience an up-close encounter with whales. Most of the Fjords melt by May, so June and July are usually the best month for cruising among icebergs and whale watching along the breathtaking coastline. Typical encounters are humpback, minke and fin whales but occasionally also blue whales, killer whales, narwhals, beluga whales, sperm whales and pilot whales. Patience is required but richly rewarded. The icebergs in Greenland include the Ice cap, ice fjords, icebergs, pack ice and drift ice. Ice is a prevalent theme in Greenland. 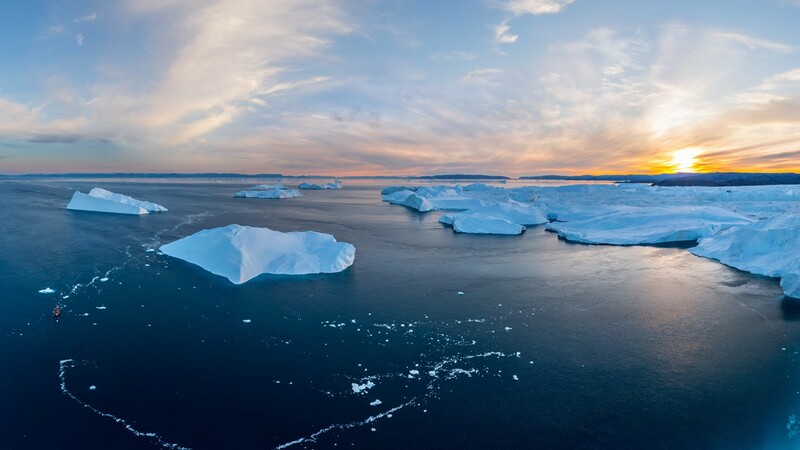 Which is only to be expected, After all 80 percent of Greenland is covered with ice all year around, at the same time the ice is fascinating aspect of Greenland, as it is so fabously vast and posses such diverse beauty. Climbing Ukkusissat Mountain in Nuuk is a real adventure. Greenland is known as a hiker’s paradise. In Nuuk it is said that you are not a true ’Nuummioq’ until you’ve climbed Ullusissat which is just outside the city center. Aurora Borealis is a Nordic country which is proud to experience this unique phenomenon. The Northern lights appear from early autumn and can be seen throughout April. Meat from marine mammals, game, birds and fish has been the main ingredients in Greenlandic for generation. Most restaurants in Greenland serve the same typical food as Denmark and other Nordic countries. There are a number of Thai restaurants in Greenland. The strongest drink is Greenlandic coffee. A coffee gathering called Kaffemik is a wonderful opportunity to meet friendly locals. Nightlife is very slow outside of Greenland’s main city. Very few communities have at least one pub, discotheque or spot for live music. Although pubs are part of many Greenlandic restaurants, restriction for youngsters drinking at the age of 18 are not allowed to enter. Greenland’s summers parties last as long as the midnight sun is out. Thus Greenland offers an abundance of exciting and different experiences.